Europe's Jews and other minorities. What happened in Germany ? How much was known inside and outside Germany of these mass murders? Current estimates might change as new documents are discovered or as historians arrive at a more precise understanding of the events. What follows are the current best estimates of civilians and disarmed soldiers killed by the Nazi regime and its collaborators. What follow are the current best estimates of civilians and disarmed soldiers killed by the Nazi regime and its collaborators. and on evacuation marches from concentration camps and labor camps in the last six months of World War II. It also includes people caught in hiding and killed in Poland, Serbia, and elsewhere in German-occupied Europe. 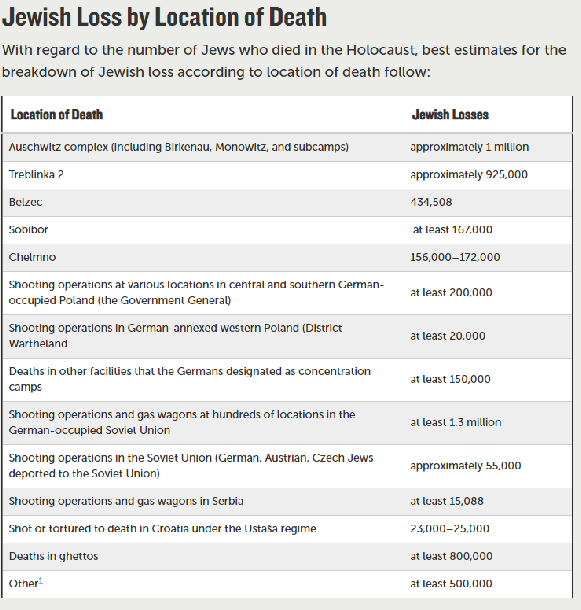 1) Compilation of comprehensive statistics of Jews killed by German and other Axis authorities began in 1942 and 1943. It broke down during the last year and a half of the war. 2) Beginning in 1943, as it became clear that they would lose the war, the Germans and their Axis partners destroyed much of the existing documentation. They also destroyed physical evidence of mass murder. 3) No personnel were available or inclined to count Jewish deaths until the very end of World War II and the Nazi regime. Hence, total estimates are calculated only after the end of the war and are based on demographic loss data and the documents of the perpetrators. Though fragmentary, these sources provide essential figures from which to make calculations. 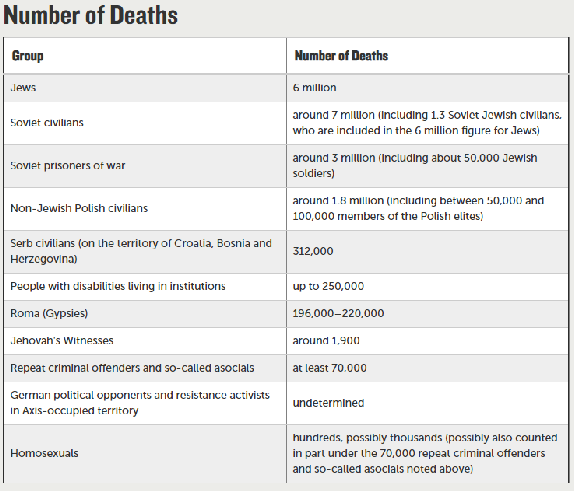 Approximately 11 million people were killed because of Nazi genocidal policy. 5 million of those murdered were non-Jewish. Others were Nazi victims because of what they did, who they were, their genetic or cultural origins, or health conditions. It was the explicit aim of Hitler's regime to create a European world both dominated and populated by the Aryan race. The Nazi machinery was dedicated to eradicating millions of people it deemed undesirable. Some people were undesirable by Nazi standards because of who they were, their genetic or cultural origins, or health conditions. These included Jews, Gypsies, Poles and other Slavs, and people with physical or mental disabilities. Others were Nazi victims because of what they did. These victims of the Nazi regime included Jehovah's Witnesses, homosexuals, the dissenting clergy, Communists, Socialists, ‘asocial’s, and other political enemies. Those believed by Hitler and the Nazis to be enemies of the state were banished to camps. Inside the concentration camps, prisoners were forced to wear various coloured triangles, each colour denoting a different group. The letters on the triangular badges designated the prisoners' countries of origin. Christian Poles and other Slavs, notably Ukrainians and Byelorussians, were also primary targets of Nazi Germany hatred during World War II. To the Nazis, the Slavs were considered Untermenschen,or subhumans, and nothing more than obstacles to gaining territory necessary for the superior German race. There was not one badge designation for Poles and other Slavs. Rather, a Polish or Slavic person was categorized as a criminal, asocial, political prisoner, and so on. The Roma, a nomadic people believed to have come originally from northwest India, consisted of several tribes or nations. Most of the Roma who had settled in Germany belonged to the Sinti nation. The Sinti and Roma had been persecuted for centuries. The Nazi regime continued the persecution, viewing the Roma both as asocial and as racially inferior to Germans. Like Jews, they were deprived of their civil rights. In June 1936, a Central Office to "Combat the Gypsy Nuisance" opened in Munich. By 1938, Sinti and Roma were being deported to concentration camps. By 1943, a large area of the camp complex Auschwitz-Birkenau was assigned to house deported Sinti and Roma. The number of inmates is estimated to have been some 23,000. Many became the victim of medical experiments; others died of exhaustion or were suffocated by poison gas. The camp was dissolved in August 1944. Many of its prisoners were murdered or transferred to other camps. Gypsies wore brown cloth triangles. A state policy of persecution of homosexuals began in Germany in 1933. Publications by and about homosexuals were prohibited and burned. In 1934, a special Gestapo division on homosexuals was set up. German police raided gay clubs and bars and made arrests. Some homosexuals spent time in regular prisons, and an estimated 5,000-15,000 were sent to concentration camps. Those defined as homosexuals were designated by a triangle of pink cloth attached to their clothing. In 1933, the Jehovah's Witnesses in Germany totaled about twenty thousand. In 1934, Jehovah's Witnesses attempted to fend off Nazi attacks by having congregations send letters to the government explaining their beliefs and political neutrality. The group was banned by national law in April 1935. Those Witnesses who defied the ban on their activities were arrested and sent to prisons and concentration camps. Jehovah’s witnesses were marked with purple triangular badges. Approximately 2,500 to 5,000 died in Dachau, Belsen, Buchenwald, Auschwitz, and other camps. These people never were assigned a badge because they were rarely sent to concentration camps. Persons with physical or mental disabilities threatened the Nazi plan for human "perfection." In 1934, forced sterilization programs sterilized 300,000 - 400,000 people, mainly those in mental hospitals and other institutions. The remnants of the Communist and Socialist parties and members of the trade unions resisted the Nazi regime. As did any members of the clergy, of all denominations, who like Pastor Martin Niemöller , opposed Adolf Hitler's efforts to bring the German churches under control of the Nazis. He also founded the Pastors' Emergency League, a group, among its other activities, helped combat rising discrimination against Christians of Jewish background. In 1937, Niemoller was imprisoned for four years in solitary confinement and eventually sent to Sachsenhausen and then to Dachau concentration camps, he was moved in 1945 to the Tirol, where Allied forces freed him at the end of World War II. In the early years of the Third Reich, political prisoners were a significant portion of the concentration camp inmates. At the end of July 1933, about 27,000 political prisoners were being held in concentration camps in "protective custody." Dachau was always a camp for political prisoners. When the Nazis came to power there were hundreds of African-German children living in the Rhineland, the offspring of German mothers and African soldiers brought in during the French occupation. Hitler claimed these children were part of a Jewish plot to begin "bastardising the European continent at its core." Under the Nazi regime, African-German children were labeled "Rhineland Bastards" and forcibly sterilized. Around six million people were killed in the Holocaust, the Nazis' systematic attempt to exterminate the Jewish people. Jews from across Germany and Nazi-occupied Europe were rounded up, and either transported to extermination camps where they were gassed, shot locally, or starved and abused in ghettos and labour camps until they died. This was murder on an industrial scale, and it took an industrial process to do it. From the office workers who planned and oversaw the logistics, to the railway staff who ran the trains, to the community policemen who guarded the streets, hundreds of thousands of ordinary people were part of this attempted genocide. It can be hard for us to even try to understand how this was possible. We might assume that ordinary citizens were so terrified of retribution from the vicious Nazi regime that they reluctantly went along with it. But the truth is far more disturbing than that. In fact, thousands of people, who had lived side by side with their Jewish neighbours for generations, were quite willing to turn on them and become part of a programme of mass murder. As a boy, Anthony Sawoniuk earned money running errands for Jews on the Sabbath. In 1941, his home town of Domaczewo (then part of Poland, now in Belarus) was captured by the Nazis. He volunteered to join the auxiliary police. His unit guarded the local Jewish ghetto. On 20 September 1942, nearly 3,000 Jews were rounded up and murdered. Sawoniuk led search-and-kill police squads that hunted down those who tried to escape. Police squads like this were set up across Poland, Ukraine, Latvia and Lithuania. They were trained to fight against partisans and also murder Jews. Austrian-born Hermine Braunsteiner could not afford to fulfil her ambition to become a nurse, so worked as a maid instead. After the Nazis annexed Austria she started working in an aircraft factory in Berlin, and then took a better-paid job as a guard at Ravensbrück, a women's concentration camp. She was later transferred to Majdanek in Poland, a concentration camp which also served as an extermination site. She was involved in selecting women and children to be sent to the camp's gas chambers and became infamous for her brutality towards prisoners. By the end of the war there were 3,500 female guards employed in various concentration camps. After attending one of France's most prestigious schools, Maurice Papon joined the civil service and rose rapidly through its ranks. When the Nazis occupied France in 1940, he kept his job and served in the collaborationist Vichy government. He was responsible for Jewish policy in the Bordeaux region, and signed documents which led to the deportation of almost 1,600 Jews to a transit camp outside Paris. Most of them were later deported to Auschwitz, where they were murdered. 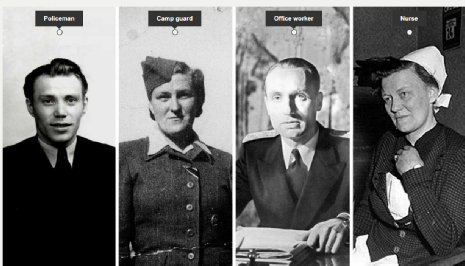 Across Nazi occupied Europe there were thousands of "desk murderers" who assisted the logistics and administration of mass slaughter from remote offices. At the beginning of the war, Irmgard Huber was head nurse at the psychiatric hospital in her hometown in Germany. In 1940 the hospital became a T4 killing centre. T4 was the codename given to the Nazi operation in which around 70,000 German and Austrian adults with mental or physical disabilities were murdered. At least 14,000 people were killed at her hospital. Huber was responsible for the drugs which were used in the lethal injections. She also had a role in falsifying death certificates which were sent to families of the victims. Doctors, nurses and administrators worked in six killing centres across Germany and Austria. They were the testing ground for the death camps in Eastern Europe. Although some ordinary people in Germany and occupied Europe were brave enough to help the Jews, others became killers. Looking at the background of just four of the people involved in the Holocaust and wider Nazi atrocities against the disabled and other groups, shows that there was nothing that marked them out as sadistic murderers. What motivated people to become killers in the Holocaust? Natasha Kaplinsky looks at the evidence. Click on the website labels to find out more. After the war, many of the people who played their part in the Holocaust said that they had no choice but to follow orders. Yet historians and German prosecutors have failed to find a single case of any person being threatened with death or imprisonment for refusing to take part. The story of Reserve Police Battalion 101 shows that even when given a choice to opt out, ordinary people went on to commit atrocities. In 1942 the battalion was sent to Poland to take part in the rounding up of Jews. It was made up of ordinary middle-aged men, many with families. Just three weeks after their arrival, the men were sent to the village of Józefów, home to 1,800 Jews. The commander, Major Wilhelm Trapp, stood up in front of the gathered men. As he began to speak they noticed he had tears in his eyes. Trapp told his men to round up all the Jews living in this village as there had been reports that they were involved with the local partisans. He said that they should separate the Jewish men so they could be sent off to a work camp. However, the woman, children and the elderly should be taken aside and shot - and although he did not like what they had been asked to do, it would make it easier if they remembered that, back home in Germany, bombs were falling on women and children. At the end of his speech, Trapp said that those who did not want to take part, could step aside. Of the 500 men standing there that day only fifteen chose to opt out of the killing. The rest went on to massacre all the Jewish women, children and elderly people in the village. Over the course of the war the battalion went on to murder thousands of Jews. Although some high-ranking Nazis were prosecuted at the Nuremberg and later trials, many perpetrators were never investigated. The sheer number of people involved made it logistically impossible. Once the Cold War started, the Allies spent less and less time pursuing perpetrators. 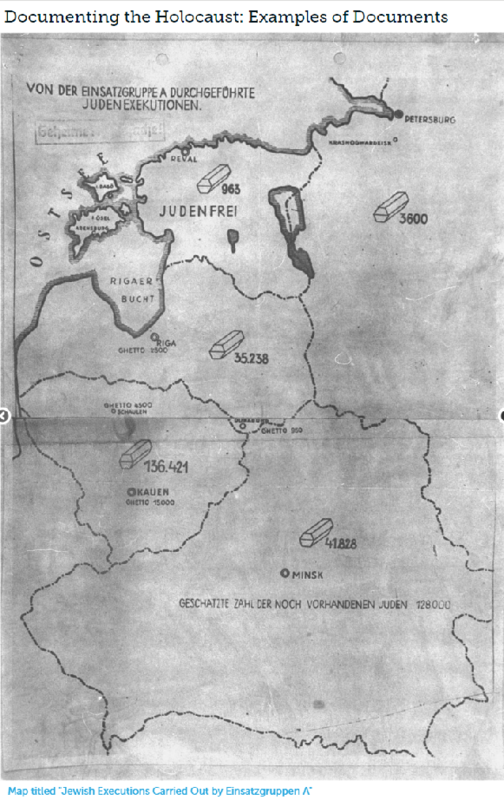 West German and Austrian authorities were also unwilling to investigate large numbers of their citizens. Some had fled to South America, where right-wing dictatorships offered them refuge. Others found their way to the US, Canada and Britain. Presenting themselves as refugees from communist regimes, they were rarely questioned about their wartime activities. Click on the website labels to find out more. 6. COULD IT HAPPEN AGAIN? In many ways the Holocaust was the most modern genocide the world has ever seen - carried out using all the bureaucratic institutional capacity of the modern state; aimed at eliminating Jews wherever they were caught, anywhere in the world. Might we ever experience anything on this scale again? Sadly, one thing that we've learnt is that we seldom learn from history. There are many singular aspects about the Holocaust, but the nature of killers does not seem to be one of them. Any government that has wanted to commit genocide has not failed from a shortage of executioners. Governments have the power to create an institutional, organisational, situational framework that will harness people to kill. They prey on people's conformity, their deference, and their desire to be held in the esteem of their comrades. If there are historical circumstances where a traditional dehumanising stereotype already exists, then it’s so much easier to implant fear and dress up what’s being done in terms of self defence against some alleged ominous enemy. However, we do know from past situations that it doesn’t require centuries of hatred or long term animosity. In fact, mobilization for mass killing has been accomplished very quickly. The international community has learnt not only from the Holocaust, but also from the genocide in Rwanda 20 years ago. Since World War Two, the international community has criminalized genocide and established the International Criminal Court, more recently with the creation of the Criminal Tribunals for the former Yugoslavia and for Rwanda. They work to create a culture of accountability and to combat a culture of impunity. Those who contemplate inciting or organising these atrocity crimes know that they could be held to account for their actions. They have created a climate in which acts of this kind are no longer seen as something within the domestic jurisdiction of states, or as part of the 'normal' course of war. They are now a matter of international concern, and can be discussed in international forums such as the United Nations Security Council. Even so, we cannot say enough has been done, as we continue to see some instances of crimes against humanity or genocide which have not galvanized sufficient international action. Given constraints on the capacity of outside actors to respond, or strong political interests working against international action from powerful neighbours, we still do not see consistently strong responses to evidence of atrocity crimes. The current system of international law places important constraints on the power of the state, but it has not stopped atrocity. If there is inadequacy, it is not in the content of the rules but in their enforcement. It is inadequate in many countries, and it is inadequate at the international level. The International Criminal Court has begun to operate in relation to some crimes, but only in Africa, a continent that does not have a monopoly in respect of international crimes. Mass killings and atrocities did not end in 1945. Around the world there have been terrible events, as we all know, and no continent has been immune from large-scale killings in which great numbers of individuals have been targeted and killed because they happen to be a member of a particular group – racial, religious, ethnic, political and so on. Each situation is different, to be understood in its own context. Could acts akin to the Holocaust happen again today? Yes. What drives people to exterminate others? The historian Daniel Pick reveals the story of an extraordinary project which aimed to unearth persecution's roots, from witch-hunts to the Holocaust and beyond. In 1961, Adolf Eichmann, one of the chief organisers of the Holocaust, was tried in Jerusalem. Among those deeply troubled by his apparent ordinariness was David Astor, the editor of the Observer . Astor was also an enthusiastic champion of psychoanalysis, and made a speech declaring that the 'political psychopathology' of Nazism - and other examples of persecution and extermination - should be investigated. And he had the money to make this happen. The historian Norman Cohn contacted Astor and offered to help. Cohn was the author of The Pursuit of the Millennium, a pioneering study of the ways medieval utopian visions led to 'purifying' massacres. With Astor's support, Cohn set up the Columbus Centre, a team of historians, sociologists and other scholars who set about investigating the psychological roots of the Nazi mass killings of Jews and Gypsies, and much earlier examples such as the witch-hunts across Europe in the Middle Ages. One member of the team, psychiatrist Dr Henry Dicks, even visited West German prisons to interview convicted SS killers and concentration camp guards face to face. In this programme, Daniel Pick investigates the story of the Columbus Centre, drawing on exclusive access to private recordings of the Centre's meetings. And he explores the impact of the project today, from terrorism studies to the Tribunal that tried the perpetrators of the Rwanda genocide. With: Jeremy Lewis, Lucy Astor, Adrian Dicks, Marina Voikhanskaya, Steven Reicher, John Horgan, Frank Chalk, Albie Sachs. On the 22nd of June 1941, German troops launched Operation Barbarossa, Germany's attack on the Soviet Union. 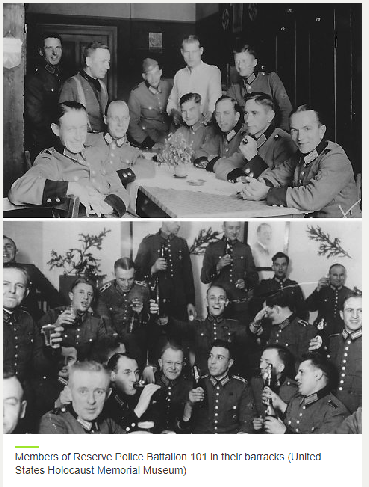 From the point of view of the Nazis, this was not an ordinary military conflict, but a battle against the chief ideological and racial enemy of the German nation. Since the 1920s, the Nazis had declared Bolshevism to be the greatest threat to European society, and claimed that the Soviet regime was a front for a Jewish conspiracy that aimed to rule the other nations. As the Nazis penetrated into the interior of the Soviet Union, they gained control over the numerous Jewish communities that were dotted in a broad band spreading from the Baltics, across Belarus and Ukraine to the Black Sea. At the rear of the German army were four Einsatzgruppen (link in Czech) - special units whose task was the fight against ideological opponents. They were required to kill all Communist functionaries, Jews holding party and state functions, and other „radical elements“. In reality, however, the main role of these units was to massacre the Jewish communities. To begin with, only Jewish men were murdered, but soon women and children were also being killed. The largest single massacre was the execution of over 30 000 Kievan Jews in Babi Yar at the end of September 1941. It is estimated that these units, aided by local militia and in coordination with the army, slaughtered approximately 1.25 million Jews in all, as well as hundreds of thousands of other Soviet citizens. From the invasion of the Soviet Union onwards, however, the genocidal policy implemented in the occupied Soviet territories was to be extended to all Jews in the Nazi sphere of power. The decision to kill the European Jews was undoubtedly taken by spring 1941 at the latest. Himmler's SS faced a double problem, however firstly, finding a suitable and effective method of killing, and secondly, transporting the victims to the place of their death. 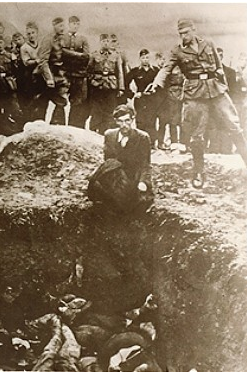 The Nazis experimented in their search for the most effective killing method, one which would not take such a heavy toll on the killers' psyche as the mass shootings that were carried out by the Einsatzgruppen in the conquered territories. Indeed, it was the Einsatzgruppen who in November 1941 started to use a new method of extermination - mobile gas chambers, in which the victims were killed by exhaust gas. From December 1941 on, these lethal vehicles were used in Chelmno. A total of 20 mobile gas chambers were produced. In 1942 the already-existing concentration and labour camps in the Generalgouvernment were transformed into extermination camps, the task of which was to murder the greatest number of victims in as „effective“ a way as possible. Killing by gas, which had already been used in the „euthanasia programme“ (link in Czech), was now considered by the Nazi planners to be the most suitable way of carrying out the murder of millions of people. From the start of 1942 on, extermination centres were gradually created, equipped with permanent gas chambers. Some of the staff who had gained experience in the „euthanasia“ programme was now transferred to the camps designated for the mass murder of Jews, where they set up the gas chambers. In February they were installed in Bełżec, in May in Sobibor, in July in Treblinka and in Majdanek they were in operation from September 1942. These gas chambers were usually disguised as showers, and used exhaust fumes to kill. The whole operation was named Operation Reinhard, after Reinhard Heydrich, who had been assassinated by Czechoslovak parachutists in Prague on the 27th of May 1942. It did not end until the close of 1943, when the extermination camps at Bełżec, Sobibor and Treblinka were closed. In all, over 1.7 million Jews were murdered in them while they were in operation. The chief pillar of the extermination process was the camp at Auschwitz, where between March and June 1943, four new gas chambers were built. These used the poisonous gas Zyklon B to kill. The new gas chambers were installed in the Auschwitz-Birkenau camp, founded near the original camp. Auschwitz received transports from the whole of Nazi-occupied Europe. After arriving in the camp, most of the transports went through „selection“, in which the SS selected a few prisoners for forced labour, the others being sent to immediate death in the gas chambers. Those who were not murdered immediately on arrival were not to be spared, but were to be exterminated in a process known as „Vernichtung durch Arbeit“ - destruction through labour. These prisoners, dispersed throughout the auxiliary Auschwitz and other camps that formed the extensive system of Nazi concentration camps, were forced to engage in slave labour in inhuman conditions, leading to utter exhaustion that usually ended in death. What did the rest of the world know about the Nazis’ policies of annihilation during World War II and the terror and mass murder spreading across Europe as a result? As [Hitler’s] armies advance, whole districts are being exterminated. Scores of thousands, literally scores of thousands of executions in cold blood, are being perpetrated by the German police troops upon the Russian patriots who defend their native soil. . . . And this is but the beginning. Famine and pestilence have yet to follow in the bloody ruts of Hitler's tanks. News also filtered out of occupied Europe through government channels. Following Poland’s defeat by Germany, Polish leaders had established a temporary “government in exile” in Britain. In June 1942, they received a secret report from occupied Poland confirming that the Germans were murdering Jews throughout the country. Newspapers around the world carried the story. The Allies believed that the best way to help the Jews was to win the war. They warned Nazi leaders that they would be held responsible for their crimes once Germany was defeated. What information was available in Britain and the United States about massacres in the Baltic states and the USSR in the early 1940s? What information was available about the concentration camps and death camps in 1942? Why did Churchill call the mass murders of 1941 “a crime without a name”? Why might it make a difference to have a name for a crime? Why would articles about mass murder have failed to make the front pages of newspapers around the world? What forces might shape or determine the selection of the stories that newspapers feature today? Resources Our resources can help you learn more about the Holocaust and genocide and plan your own HMD activity. Explore life stories of survivors and those who were murdered, schools materials, activity ideas, films, images and more using the filters below. Why Facing History and Ourselves Our mission is to engage students of diverse backgrounds in an examination of racism, prejudice, and antisemitism in order to promote the development of a more humane and informed citizenry. Shadows Of Shoah River of Tears is Shadows of Shoah's innovative new exhibition, debuted in Queensland, Australia, in 2016. It is a unique high-end presentation of Holocaust survivors' stories using strong black and white portraiture, original music, kinetic elements, and audio and visual effects. These are choreographed to present selected episodes from survivors' experiences in a brief, compelling format. River of Tears builds on the concepts, stories and success of The Shadows of Shoah Exhibition, a work which toured nineteen New Zealand locations following its launch by Prime Minister John Key in 2013. River of Tears has been invited to be staged in Croatia in 2019. Expressions of interest from the Northern Hemisphere are welcomed. 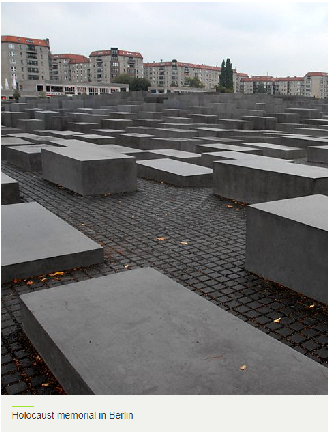 LEARN ABOUT THE HOLOCAUST AND GENOCIDES On Holocaust Memorial Day, we remember the six million Jews murdered in the Holocaust, and the millions of people killed under Nazi Persecution, and in the genocides which followed in Cambodia, Rwanda, Bosnia, and Darfur. The Holocaust was a terrible and defining episode of the twentieth century, which undoubtedly changed the course of history. After the Holocaust, the international community adopted a legal definition of the crime of ‘genocide’. They wanted to make sure that never again would the crimes of the Holocaust be allowed to happen. However, in the years following the Holocaust, genocide has continued to be carried out. On Holocaust Memorial Day we remember all those who were murdered or affected by the genocides in Cambodia, Rwanda, Bosnia and Darfur. Subsequent genocides represent a failure of humanity to learn from the Holocaust and are a reminder for all of us that we must be prepared to guard against genocide happening again in the future.